The car that started it all. The Car made into Legend, and the beginning of DECO RIDES. Possibly one of the most fluid automotive shapes ever developed, the original piece of rolling sculpture started as a 1939 Lincoln Zephyr coupe designed by E. L. Gregory as a streamlined competitor for Chrysler’s mid-30's AIRFLOW. In 1994 former HOT ROD Magazine Editor Terry Cook, whose consuming passion is classic car styling and custom coach building, commissioned Ramsey Mosher of Dover, DE to resculpture an original Zephyr coupe over a four and a half year period. When it debuted in 1998, the radical, smooth flowing lines of "SCRAPE" rocked the world of old car enthusiasts back on its heels. Terry was invited to exhibit "SCRAPE" at Concours at Meadowbrook and the Louie Vuitton Classic in Manhattan, the SEMA Show, and then toured 20 major car shows in the USA and Canada as the feature attraction. Mattell built a 1/18 scale HOT WHEELS toy of the car and it immediately sold out. The car was sold in 1990 at the RM Auction at the Pebble Beach, CA Concours weekend for $275,000 to the Robert E. Petersen Museum in Los Angeles where it now resides. Prior to that, Cook had the foresight to have molds made off the body of the car he had designed so he could reproduce coupes, and a new convertible, in fiberglass composite. He started a new company called DECO RIDES, a subsidiary of Appleton Productions Inc., to market the custom Zephyrs. Additional tooling for a fastback and sedan delivery Zephyr body style were also developed by DECO RIDES. Steve Coonan photo shows Niche Bahn 17-inch front wheel. Note 15-inch wide white with "ripple disc" in other two views. After copyrighting his design and then selling the original car, Cook reinvested some of the proceeds from that sale into upgrading the molds and went on to build and sell more than 50 restyled Zephyr fiberglass bodies over a period of four years. There are now completed DECO RIDES Zephyrs from Moscow to Australia.. 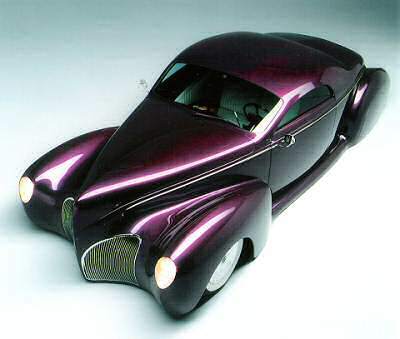 In November of 2003 Cook entered into an exclusive agreement with Speedster Motorcars of Clearwater, FL to have them build finished "turnkey" recreations using the DECO RIDES molds. As part of that agreement, Cook and DECO RIDES agreed to no longer manufacture or sell individual Zephyr bodies. Read the story of the creation of SCRAPE. See photos of the Z-Series Car inspired by SCRAPE. Lead East-- World's BIGGEST 50's Party!